BE SURE TO LOOK AT THE WEB ALBUMS CONTAINING 100+ PICTURES BELOW! If you have any questions about this property or would like to express interest in it, please fill out the incredibly easy to use form at the bottom of this page. This is a fantastic property which is located literally right across the road from Anderson Lake State Fish & Wildlife Area. This property was abandoned by its former owner and we have cleaned it up but left the shell of the structure that remains on the property. This structure makes the property a bit of an eyesore but there is a ton of potential for improvement. We decided to leave the structure in place even though there isn't much to it because it could make a great starting point for someone wanting to turn it into a small cabin or house. Alternatively, the structure's shell could be easily dismantled and torn down if this is something you desire and we would be glad to help do this as part of a purchase by a buyer if needed--just let us know! The real diamond in the rough on this property is the new, thick concrete floor underneath the old cabin structure. This is a huge plus! Concrete work like this can run in the thousands of dollars and if you buy this property, you're basically getting it for free! Be sure to check out all the pictures to see this in detail. This concrete pad could serve as a great base for a new cabin or home or place to park an RV or camper. Attention Outdoors-people: If you are an outdoor enthusiast and have some handyman skills, this could be the perfect property for you to turn into a home, a cabin or a vacation destination. You don't need to go any farther than across the road to get your fill of all the hunting, boating, fishing and camping you could ever want! Or you can just sit and enjoy the view from the property. It's hard to find private property any closer to a state park than you get with this lot! This property has been surveyed and the corners have been marked. You will get a copy of the survey plat so you can buy this property knowing exactly the size of the property as well as where all your boundary lines are located. The aerial image below shows the approximate boundaries of the property as well as the entrance to Anderson Lake literally across the road from this property!! 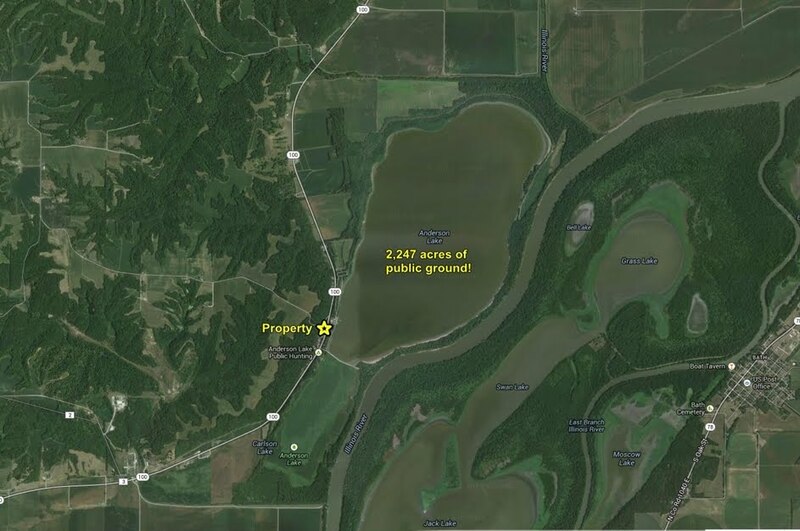 The aerial image below of the larger region puts in perspective how huge Anderson Lake really is and how much public hunting, fishing and camping ground there is! Unlike many sellers of real estate, we are willing to work with buyers to find a financing solution that is affordable and meets your needs. You can purchase this property one of two ways. The first is with a cash offer, either with cash from savings or from a bank loan. The second is to get financing from us in the form of a contract-for-deed, which is a form of seller financing that helps buyers avoid the difficult and costly process of going through a bank to obtain a mortgage loan. The minimum requirements for this type of arrangement is: 1) a 5% downpayment; 2) monthly payments of at least $250; and 3) interest of 8% per year on the balance of the loan. Paying more per month would reduce the length of the financing and there are no penalties for paying it down early. Once the last payment has been made, the deed will be transferred to the buyer. 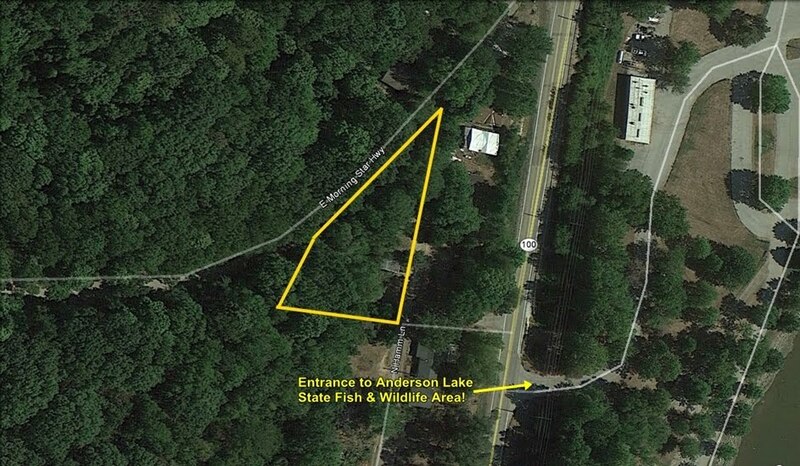 Below is an interactive Google map which shows the location of our Anderson Lake Lot. This property is located in a wonderful rural setting and with a view of Anderson Lake from your doorstep!